Sod Webworms—are one of the regions “silent killers”, as their damage often goes unaccredited to them. Most of their damage is blamed on drought stress or on grubs, but in reality these tiny little caterpillars are quietly feeding on the lawn. 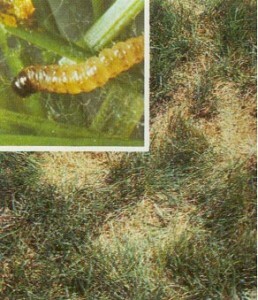 In their caterpillar stages, sod webworms are serious pests of lawn grasses. The caterpillars are about 3/4 to 1 inch long. The adults are buff-colored or grayish-brown moths with a wingspan of about an inch. These adults fly in the early morning or late evening in a jerky zigzag pattern, just a few feet above the lawn. They fly up from their hiding places when tall grass is mowed or shrubbery is disturbed. 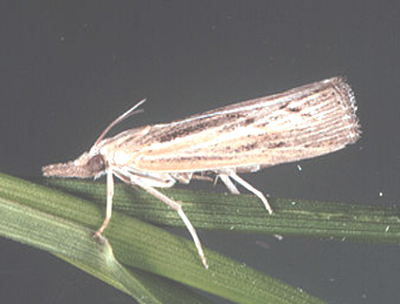 Sod webworm moths do not feed on lawn grasses, but they do drop their eggs into the grass as they fly. After 6 to 10 days, the eggs develop into very hungry caterpillars. These immediately begin feeding on grass blades, and are active only at night. As they feed, they build silk-lined tunnels in the thatch near the soil surface. During the 35 days or so that the webworm lives as a caterpillar, it can eat about 4 square feet of grass. By late fall the webworms are nearly mature. They over-winter curled up in the soil as pupae and emerge as moths in the spring to begin feeding and laying eggs as soon as the soil temperature rises-in late April to early May. First generation larvae feed from late June to the end of July. 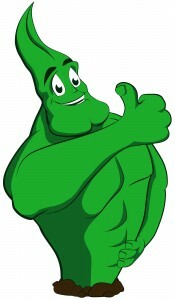 The second generation can be a more serious problem because the host grasses are usually dormant or under stress and can’t replace damaged foliage. Sod webworms may produce up to 3 generations a season, generations overlapping and having all life stages—eggs, caterpillars and moths—present in the lawn at the same time. Damage will really show itself during hot, dry periods. Correct diagnosis, proper management and regular watering are needed to ensure their damage does not get out of hand.